If I had read Uncompromising as a teenager I would have fist pumped the air and danced around the room exalting in the fact that I was on the right track. (Yeah, a bit prideful.) This is one of those, "If I ever wrote a book it would look like this..." books for me. Which almost makes me a bit unqualified to talk about it, in my opinion, because I have a lot of love for it. I love it so much I'm sliding it onto my book shelf to keep and hand over to my daughter a decade or so from now - because this book will still be relevant and necessary even in ten years. It will be relevant until the end of time because young women everywhere will constantly be warring against their sin natures as they pursue their individual relationship with God. For as long as this internal struggle exists, there will be a need for women like Hannah Farver to stand up and encourage other women to pursue Christ whole-heartedly. That is the point of this book. In Uncompromising : A Heart Claimed By a Radical Love, Farver discusses causes that get in the way of pursuing THE Cause of a Christian - following Christ in a whole-hearted fashion. She primarily focuses on two little 'c' causes that frequently cause females (in particular) to stumble: beauty and romance. Her discussion of these topics does come across as a bit "hip" in the sense that she uses a bit of sarcastic humor and dialogues with her reader a bit as she writes. That comes across as "friendly" writing and she acknowledges this to be the case, while also being quick to specifically point out that she is not trying to write in such a manner as to claim every reader as her best friend. She is a conversationalist who states that this book is pretty much a collection of Notes to Self in a sense. She has an approachable writing style for this time in history. I can't say that this style of writing will be good for all time, (regardless of the message), but it suits for now. She directs her remarks primarily to single Christian women. * We should not submit or buy into the world's definition of beauty. Beauty, she argues, is individualized and is most apparent when a woman is acting and behaving in a manner that brings glory to God. This, Farver argues, (and I would agree), is the woman's express purpose. * God created both male and female for His glory. Both are image-bearers but they function differently. Without launching into what could be come a very long argument, she is basically a proponent of Biblical femininity. * Farver also takes the time to talk about entering into a romantic relationship - the primary focus on the discussion centering around the importance of purity. In short (as I can make this!) - I really, really, really liked this book. I think it's a good message for young women of today and one that is worth being considered. It is this: to love and follow Christ above all. That's a hard thing to do. Every little bit of personal encouragement helps! Therefore I'm a fan of this book. It is much-needed encouragement and is therefore welcome to some space on my bookshelf. 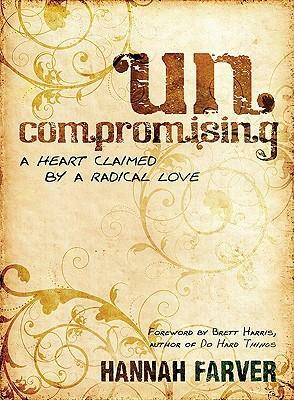 I'm excited to say that the publisher, Moody Publishers, has offered up FIVE copies of Uncompromising to five of you! This is most generous. In order to win, all you need to do is leave a comment below. I'll give you an additional entry if you have a daughter of age to read this book RIGHT NOW. (Just leave two comments if you have a daughter between the ages of 11-19.) I'll do that this time because I think this book is particularly relevant NOW! This contest will be open through Tuesday, July 26th and is open to U.S. Residents only. Thank you, Moody Publishers, for sending a copy of this book my way and for offering to give away additional copies to some of my readers. I hope and pray that we make the most of this book's message. This one is also on my wish list. And leaving the 2nd comment since my girl is almost 13. My dad had already mentioned this book to me before and I want to read it even more after reading your review. Hey, I'm eighteen. :) This book sounds like one I would really enjoy. Thanks for the giveaway! I am leaving a second comment for my 17 year old daughter--would love to have a copy for her! Sounds like a great book. I think I would be sending it over on long term loan to my teenage (and almost teenage) sisters! Would love to read this book! I don't have a daughter but I do have a 2yo niece who will be ready for this book one day. I've followed Hannah's blogging for some time, but would love to have her book too! Yessss please! I would love to get a copy of this book-- unfortunately can't really afford much else right now thanks to tuition. :( Please enter me! My daughter is not quite in the target age range, but I would love to have this on hand to give her in a few years. Would love to share this with my younger sisters and sister-in-law! They've been grappling with these issues lately. Oh wow, that sounds really good! Your review made me curious about this book. Would love to read it and share it with my teenage cousin. I don't have a daughter in this age group (anymore) but, I do have an 11 year old granddaughter who is living with me for the summer. I would love a copy of this book. Thank you! I would love to win and read this book. Please enter me. Thanks! I am married but this still sounds like a really good book! Second entry ... my daughter is 14 and I would love for her to read this book.